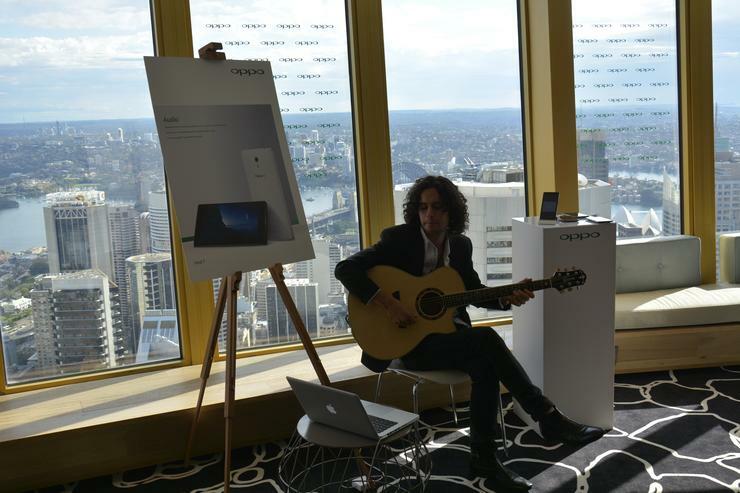 Oppo held its Australian soft launch at Centre Point Tower on September 2. Oppo has taken its first steps into the Western world with a soft launch into Australia on Tuesday, and is optimistic about its competitive prospects. The Chinese smartphone manufacturer publicised the move on August 22, inviting local media to the event not long after its dominant rival and China’s market leader, Xiaomi, forced its Australian resellers to shut down. Oppo head of marketing, Michael Tran, said the company will draw on rife competition to inspire its own innovation. The hope is to subsequently win business from a market over-saturated with brand-name buyers who flock to Apple and Samsung (with HTC, Sony, and Nokia traction on the rise). There’s no doubt Oppo sits at the base of a very steep mountain, with aforementioned market leaders well ahead; it joins the likes of Huawei, which very recently launched the Ascend P7 flagship down under, in the battle for market share. Oppo’s expansion welcomes four smartphones to Australian shores: the Find 7, N1 mini, Find 7a, and Neo 5. The Find 7 is Oppo’s flagship, and will naturally take on Samsung’s Galaxy S5, Apple’s iPhone 5s, HTC’s One (M8), and Sony’s Xperia Z2. The 5.5in device — which looks very much like the OnePlus One — ships with Google’s Android 4.3 beamed through a 2560x1440-pixel resolution topped with Gorilla Glass 3. It runs on Qualcomm’s Snapdragon 801 quad-core processor which has a speed of 2.5GHz, and is accompanied by 3GB of RAM and 32GB of internal storage (expandable up to 128GB via the microSD card slot). Fuelling the smartphone is a 3000mAh Li-Po battery with ‘Rapid Charge’ technology that promises to boost the device from flat to 75 per cent in 30 minutes. The Find 7 is being sold outright in Australia for $719. The Find 7a is the little brother, featuring a 2.3GHz quad-core CPU, 2GB of RAM, and 16GB of internal storage (also expandable up to 128GB). This version has a 2800mAh battery, but still has Rapid Charge. The RRP is $629. The N1 mini is Oppo’s attempt at capitalising on the ‘selfie’ craze. Rather than cramming two cameras of different qualities, this phone has one 13-megapixel camera (aperture f/2.0) which sits on a rotating component that swivels from rear, to top, and front. Accompanying the device is a small, rounded clicker for remote snaps via Bluetooth; it provides flexibility in shooting, but can be easy to lose (we recommend attaching it to a set of keys). The N1 mini’s specifications include a 5in, 1280x720-pixel display, quad-core, 1.6GHz Qualcomm Snapdragon TM400 processor, 2GB of RAM, 16GB of internal storage (which cannot be expanded), and Android 4.3, operating on a 2140mAh battery. This photo-savvy smartphone is priced at $539. Oppo’s Neo 5 sits at the bottom of the food chain. The $219 phone is an entry level device with features to match; a 4.5in screen, quad-core, 1.2GHz Qualcomm Snapdragon TM400 processor, 4GB built-in storage (expandable up to 32GB), 1GB of RAM, Android 4.3, and a 1900mAh battery. Stay tuned for Good Gear Guide’s reviews of the Find 7 and N1 mini.